Most of us have children because we want a home of laughter, fun and caring. Do you feel family life hasn’t turned out to be the happy experience you imagined? Are you looking for Parenting Solutions? Are you sometimes losing the cool with your kids? Is your life so busy that your family isn’t connecting like you’d love to? Does it feel as though the kids are in the driving seat and family life is out of control? Are you concerned because your child is anxious or unhappy? In a typical session there will be space for you to share your story – what’s concerning you in your family life? If you’ve never worked with a coach before you will be surprised how having someone who deeply listens to you clears your head, so you can start finding the solutions that work for you and your family. You might also notice Val uses ‘incisive questions’ – questions that cleanly and clearly help you to figure out what’s going on for you and for your child. Val will introduce you to key tools from her Koemba ‘Coaching Parent toolbox’ so you are better equipped to handle the practical parenting issues that arise for you, so you can get yourself back on track to being the parent you want to be. What are the practical details? Parent Coaching focuses on you, the parent – no need for children to be with you. Whilst even one session can give you key insights on how to create a calmer, happier family, I recommend 4 – 6 sessions, to give you the tools and ongoing support to make the change that lasts. 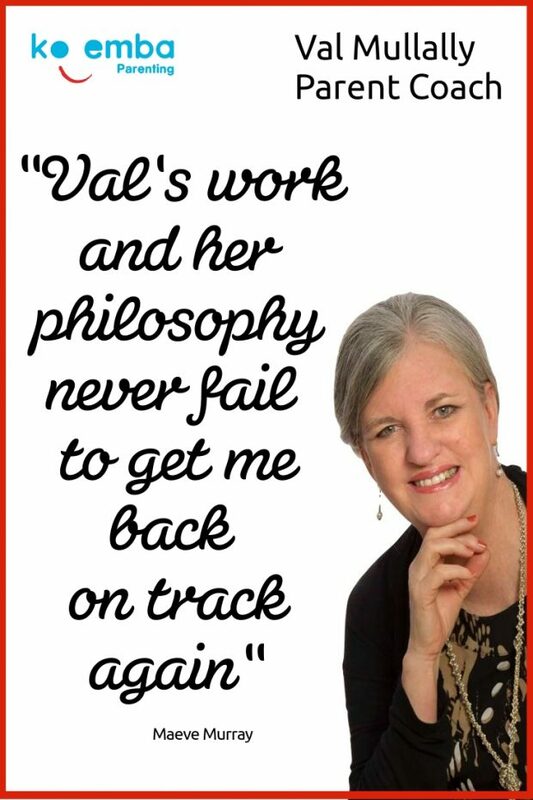 Val also offers Personal Development Coaching and Relationship Coaching. How to find out more about Parent Coaching? Call 00353 – (0)877609355 or 0044 (0) 7480396678. Or send an email to val@koemba.com so you can discover how coaching can support you to create the relationships you desire. I would fully recommend this course. This course is a journey of self-awareness, non-judgement, learning new skills, life skills, hope and positive affirmation. … an amazingly powerful way of working with parents. I have found this course immensely beneficial. An excellent course. Very well presented. The learning and content within the course is fascinating.